The town of Steinbach is an idyllic place to live. The atmosphere is quiet, clean and wholesome and residents want to keep it that way. As hard as you might work to keep your property looking clean and inviting, you can’t control graffiti. There is no one way to avoid vandalism but there is one sure-fire way to remove it. Our Steinbach graffiti removal service can ditch that graffiti and have your property looking brand new. Having graffiti on your property is a nuisance but it is not a life threatening issue and can be easy to forget. There are plenty of issues that arise for property owners and it is easy to prioritize one over the other. When it comes to graffiti, quicker is always better. The presence of graffiti on your property invites more! Whether it is a competitive tagger or just an unwanted addition, multiple layers of paint are harder to get off! In addition to being an attractant for more paint, sitting graffiti can bake into the facade of your property, making removal an even bigger challenge. That is why our Gorillas strive for same day of removal of graffiti. 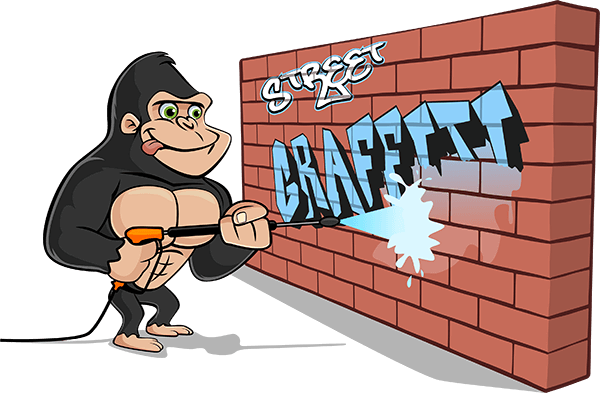 Our Gorillas are not only experts at graffiti removal, we are passionate about it! Move than that, we are passionate about customer service. That is why we strive to provide same-day service for your Steinbach graffiti removal. Having your property vandalized is enough of a headache and that is why we make the process as easy as possible. When you enlist Gorilla technicians, you can expect a clean working environment before and after out services. Our Steinbach graffiti removal service is tried, tested and true. By combining eco-friendly cleansing agents, soft brushes and elbow grease, our service gets that graffiti gone.